About the time I received the Spidi Carbo Rider jacket, the Spidi Carbo 4 glove arrived with it and boy, do they look good together. A match made in Ukraine and China respectively (with both designed in Italy, of course). Ya know, I’ve noticed that glove preference can be quite polarizing. Some folks swear by gauntlet gloves, for daily wear or in inclement weather, they pull those gauntlets on with pride to show their superiority over short cuff glove wearing fools everywhere. Others can’t really stand gauntlets, which until more recently, was my MO (hehe, see what I did there). Of course, I would wear them at the racetrack, but just about any other time, I preferred short cuff gloves. I’ve tried all sorts of weather resistant gloves too; Gore-Tex, short, long, etc. Some have done their job and some haven’t despite being gauntlet or short-cuffed. Around town, you’ll usually see me in short-cuffed mits. The Spidi Carbo 4 is the first gauntlet glove I’ve liked enough to use without a race suit on. The Carbo 4 is comfortable enough to be worn on the street or at the track. In fact, the Carbo 4 happens to be the most comfortable gauntlet glove I’ve ever worn straight outta the package. 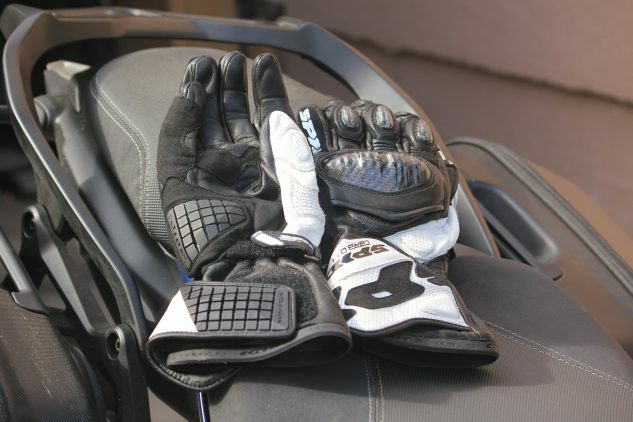 The glove is made up of goatskin with stretch panels along the fingers and thumb as well as a floating carbon knuckle slider, all of which make for a protective, yet dexterous glove. Spidi offers the Carbo 4 in three colors currently, interestingly enough, the white and black option seen here is no longer listed on the website. The large carbon knuckle slider is aided by additional carbon sliders along the first three fingers. Extra padding is found on the back of the hand, thumb, and gauntlet. 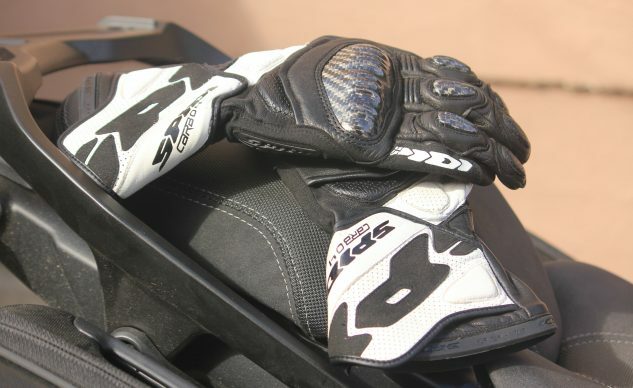 On the palm and just below it on the gauntlet of the glove is Spidi’s Warrior Tech grid-style slider technology which conforms to the rider while offering excellent impact and abrasion resistance. My only complaint with the Carbo 4 glove is that if you’re not careful when pulling them on, the rubber trim will pull off rather easily. Though the only perforations on the gloves don’t ventilate directly to the hand, I’ve never found my hands to be overly warm while wearing this glove. The size large that I received fit perfectly, and sizing was on par with other European manufacturers. 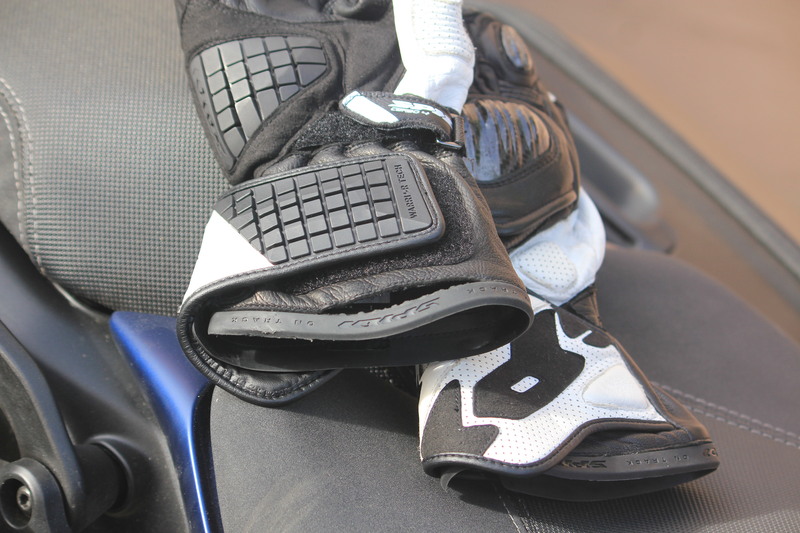 The closure is standard for a gauntlet style race glove, with a hook-and-loop wrist closure and a folding collar to fit over your jacket or suit. These are some of my favorite gloves on the shelf. 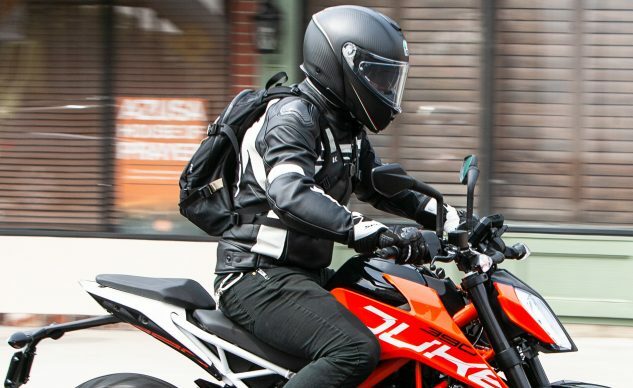 Whether you opt for the Carbo Rider jacket or something else, you’ll be stoked with the Spidi Carbo 4 gloves.